King Vajiralongkorn’s elevation to the Chakri throne means Thailand risks losing the potency of its symbolic centre during a period of sustained regional political and economic competition. Motivated opponents in the Malay Muslim majority areas of southern Thailand are looking to exploit vulnerabilities in the resolve of Bangkok’s military government; it does not help that the country’s other long-running political conflicts continue to smoulder. Policymakers around the world need to consider the potential for future turbulence at a time when the government led by General Prayuth Chan-ocha still plans that a stage-managed democracy will eventually emerge. On 13 October 2016, King Bhumibol Adulyadej, Rama IX, passed away. He had sat on the Chakri throne since 1946. He was succeeded by his son, King Maha Vajiralongkorn Bodindradebayavarangkun. Rama X is a divisive figure who, as Crown Prince, was the subject of constant gossip and innuendo. While his reputation inside the kingdom is protected by the strict enforcement of the lèse-majesté law — which includes prison terms for perceived slights against senior royals — people still talk, gravely, of his selfish and abusive tendencies. Despite these concerns about King Vajiralongkorn, the current military leadership has decided to swing behind their new monarch. For now, they do not have an alternative. In a country long considered one of Southeast Asia’s most successful these are fretful times. Aside from questions about the new king’s suitability, the military, long a political force in the country, has made fresh moves to entrench its central role in the country’s politics. In 2016, they promulgated a new constitution which provided a formal role for unelected elites in the country’s decision-making. At the same time, the separatist insurgency in Thailand’s southernmost provinces, in which over 6500 have died since 2004, is causing fresh anxieties in Bangkok. A wave of bombings and arson attacks around the Queen’s Birthday in August 2016 raised concern that southern insurgents had embarked on a strategy of coordinated violence outside their usual operational areas. In 2017, there have been major attacks across the southern border provinces. In May a hospital was bombed in Bangkok in which over two dozen people were injured. The masterminds of that attack have yet to be identified. For the moment the focus is still on mourning King Bhumibol. In public, considerable efforts are made to present the country as unified, dignified, and appropriately reverential. The period of official mourning will continue until the elaborate funeral rituals are held later in 2017. King Bhumibol’s funeral will offer a chance to reassert the primacy of the monarchy and the paramount status of King Vajiralongkorn, who will clearly benefit from any transfer of the late King’s charismatic aura. Government officials are sensitive to any negative coverage of the new king. In 2017 there were threats to block Facebook if video and photos of the king in a “crop top” were allowed to circulate. The Thai government even warned citizens that any interaction on the internet with three critical commentators based outside Thailand — Somsak Jeamteerasakul, Pavin Chachavalpongpun, and Andrew MacGregor Marshall — could violate the country’s strict laws. Pavin subsequently argued that “fear — for one’s own freedom, or one’s own personal safety — is a key weapon of Vajiralongkorn’s in keeping elites around him in line”. Those elites face difficult choices about the country they seek to govern. The central question examined in this Analysis is how Thailand will respond to the triple threat of King Vajiralongkorn’s ascension, the entrenchment of military rule, and the potential escalation of separatist violence emanating from the southern provinces? The risk that Thailand faces is that the potency of its symbolic centre, the monarchy, will fade while its residual democratic credentials erode. At the same time motivated opponents in the Malay Muslim majority areas will be looking to exploit the Thai state’s vulnerabilities. Instability in Bangkok, combined with centrifugal opportunism, could undermine generations of concerted effort to distinguish Thailand from its less successful neighbours: Cambodia, Vietnam, and Myanmar. All of this will be a serious test of Thailand’s resilience and cohesion. Under King Bhumibol, Thailand enjoyed great economic success, while managing through periods of political instability. When the late king took the throne in 1946, his country was in a profoundly weak position. Its economy was in ruins after the Second World War, and the monarchy was greatly diminished by the revolution of 1932, which stripped absolute power from the king and his aides. The monarchy was faced with enemies on both the right and the left of the political spectrum and could rely on only a few strong foreign supporters. At this time, the United States began gradually fortifying the political legitimacy of the palace as it worked to make Thailand a bulwark against communist expansion in Southeast Asia. In practice, this meant strengthening military and paramilitary capabilities in Thailand, and building a wide-ranging security partnership with the country’s rulers. Those new capabilities were used in regional counter-insurgency campaigns in Laos and Vietnam, but they also bolstered Thailand’s internal security. By the 1960s, as the war in Vietnam escalated, Thailand became the primary hub for American support elements in mainland Southeast Asia. At the peak of hostilities, the kingdom hosted over 50 000 US military personnel. US investment in Thailand led to an economic boom. Links between the Thai and US militaries were reinforced, as were the ties between intelligence and law enforcement agencies. Throughout this period Thailand was ruled by a succession of military governments strongly backed by the United States. By the 1980s, military power, under unelected Prime Minister General Prem Tinsulanonda, aligned with a powerful set of royalist interests. Reverence for the king became a defining characteristic of Thai identity, spurred on by extravagant initiatives to present King Bhumibol as an essential pillar of national stability. The king’s exalted status gave rise to hyper-loyalist ‘Bhumibolist’ elements within the ruling elite. The military also used national security threats to stifle democratic currents in the country. It was only at the end of the Cold War that moves towards greater democratic participation gained new energy. Even then there were setbacks such as when the military took power again in February 1991. By 1997, however, a new constitution was promulgated, which had the potential to make Thailand Southeast Asia’s most successful democracy. Under that constitution, in 2001, the telecommunications tycoon Thaksin Shinawatra won an election on a groundswell of support for his Thais Love Thais party, with its simple slogan: “new thinking, new doing”. Thaksin took Thai political campaigning in new directions, driven by sophisticated polling techniques. He was wildly popular, especially in the provinces of the north and northeast. People in these regions flocked to offer their support for the brash business figure. He governed in blunt terms, preferring the leadership repertoire of the CEO rather than statesman. Thaksin’s support among voters made other powerful people, including in the royalist establishment, nervous. They wondered whether he planned to more fully undermine the established order of commercial, political, security, and even monarchical authority. After a tumultuous five years in power, including a period of intense street protests against his government, Thaksin was deposed in a coup by the military in September 2006. The post-coup junta offered various public explanations for overthrowing Thaksin including corruption and the prime minister’s reputed megalomania. Some saw Thaksin as anti-royalist, despite his personal devotion, as prime minister, to serving palace interests. His government was also criticised for failing to handle the sensitive security situation in southern Thailand. Separatist conflict in that part of the country has deep roots, going back hundreds of years. Thaksin was blamed when the war reignited during his time in office. What his critics conveniently forgot was that the Malay Muslim majority provinces of Yala, Pattani, and Narathiwat have long proved resistant to the centralising agendas of Bangkok. Nevertheless, armed opposition to Thai government rule did spike while Thaksin was in power. Since 2004 the government has conducted intensive counter-insurgency operations in the south, requiring concerted inputs from the military, law enforcement, and intelligence agencies. The poor return on these military efforts has underlined the conundrum: a negotiated resolution of the conflict would require substantial concessions on the part of the Thai government. Under current conditions, it is unclear whether the people coordinating attacks on Thai security forces would be prepared to accept any outcome short of independence for the provinces of Yala, Pattani, and Narathiwat. But this is unlikely to be granted. In fact, the relatively contained nature of the conflict means that, for most Thais, it is a distant concern that rarely, if ever, intrudes on their own lives. The economic malaise into which Thailand has fallen over the past decade also complicates any long-term security planning. Political instability has discouraged major new foreign investment, while a weak education system has condemned Thailand to being “trapped” as a middle-income economy. Over coming decades, Thailand will grapple with the need to manage an increasingly elderly and economically unproductive workforce. Since the 1990s, Thailand’s prosperity has been supported by access to cheap migrant labour from Myanmar, Cambodia, and Laos. If this were to stop, then Thailand could face a serious threat to its economic and social stability, right at a time when neighbouring countries are presenting their own credible claims as attractive destinations for foreign investment. The slow-burning character of the three main issues confronting Thailand — a new king, entrenched military dictatorship, and a resilient insurgency — ensures that the country’s triple threat will not disappear overnight. Indeed, the issues raised by the triple threat will be aggravated and amplified in the years to come. The aggravation will be driven, in most cases, by internal social and political forces. Activists still speak out against military rule. At the same time, there is no doubting the potential for the palace to struggle with weak legitimacy, either as a result of scandal or perhaps King Vajiralongkorn’s strong public association with military power. Amplification is an even more significant issue, especially in the unruly spaces of the internet where ideas about political change now move at astonishing speed. Thai society is thoroughly connected via Facebook and other social media channels. The military government has sought to supress what they deem subversive content. The recent Thai government campaign against online videos and photographs of King Vajiralongkorn were just the latest effort to police public discussion of royal privileges. On social media, there is a political and cultural battle about Thailand’s national direction that is only in its early phase. It is highly doubtful that the consensus about royal primacy that prevailed under King Bhumibol will survive some negative turn in the popular mood, especially if the military takes further anti-democratic steps. What will happen now that King Vajiralongkorn is on the throne? During the final years of his reign, King Bhumibol was a distant figure, who made rare appearances and almost never spoke in public. As his health faded, he became an almost ethereal figure for most Thais. Endless speculation about his health reinforced the sense that he would not recover to reclaim his former prominence. Instead, King Bhumibol ended his reign much as he started: cloistered away, a distant presence, whose circumstances were foreign to all but his closest family and advisers. Given his status, mourning the king will continue to take much time and effort over the coming months, requiring a massive investment of official resources. 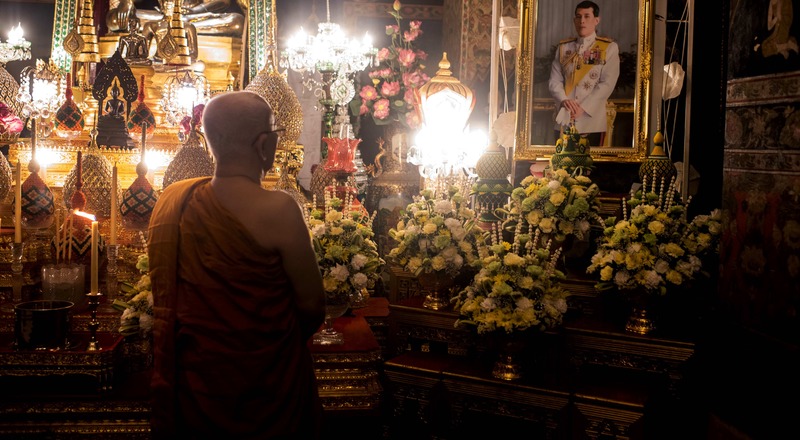 Grief about the king’s passing will then eventually fade as he increasingly takes on the deified status enjoyed by a small number of those considered to be Thailand’s greatest kings. King Bhumibol’s mythology — carefully curated by the palace’s public relations apparatus during his lifetime — provides ample material for public adoration. In death, the departed king will be a potent symbol of royal service, longevity, and political skill. With King Vajiralongkorn on the throne, Thailand will once again have a monarch who will need to be more active in public. As a 64-year-old, the people expect him to be prominent in the affairs of his kingdom. His health, a topic of intense speculation, may dictate his schedule at times, but any medical or personal interruptions will be easily explained away by palace spin doctors well-practiced in the art of making the king appear present. King Vajiralongkorn will be expected to maintain the seasonal rhythm of religious and secular rituals, from the royal ploughing ceremony to university graduations. Aspects of the king’s diary will continue to make the nightly television news. In these broadcasts his personal life is carefully managed. The draconian sanctions that follow a lèse-majesté conviction ensure that only the brave or foolhardy transgress the red lines. The new king may one day decide that he is personally comfortable with scrutiny and even criticism, but it is very unlikely that security officials will allow the loosening of what are now well-understood restrictions on commentary about the monarchy. From their perspective, the security of the royal family is indivisible from national security, and there can be no compromise with those judged to have endangered the sacred institution. The king is not, therefore, in many respects, the master of his own fate. He has inherited a vast palace bureaucracy, the incumbent military regime, and even his father’s privy council. Rituals and protocols for top royals are also difficult to change. There is even the royal language that defines references to the king. With its ornate and often impenetrable vocabulary, that language is a distant cousin to ordinary Thai and requires a significant effort to understand, let alone speak well. The royal family’s wealth also constrains the king in many respects. While he will have access to almost limitless spending money, he will also contend with the Crown Property Bureau, a vehicle for managing immense real estate and commercial holdings. The specialist administrators who have devoted their lives to the details of royal wealth management will offer sound and conservative advice. It is the army, however, that will define King Vajiralongkorn’s reign, even though he will make his own calculations about the usefulness of specific generals or the units they command. The generals who hold the most powerful non-royal positions — currently General Prem as the 96-year-old chairman of the king’s privy council and General Prayuth as prime minister — have significant political and economic authority of their own. Naturally, they prefer to subordinate themselves to the king, but that is a matter of precedence and protocol. Thailand’s actual hierarchy is less straightforward than ceremonial prostration suggests, with senior military figures, including those long retired from active command positions, such as General Prem, exerting influence deep into the armed forces and the bureaucracy. Why will the military try to hold on to power? General Prayuth and the other senior leaders in the military government, are well aware of the king’s troubled reputation among the Thai public, with his own staff, and with foreign governments. But where others struggle to comprehend his behaviour, senior military figures have the benefit of having had close contact with him over many years. Among his siblings, King Vajiralongkorn was mythologised as the warrior royal. He studied at the Royal Military College, Duntroon, Australia’s pre-eminent army commissioning school. In Thailand, he rose to the top ranks of the Army, Navy, and Air Force and flies his own planes. All of these activities have meant regular contact with military officers, including those who have served in his bodyguard and those relationships will prove increasingly valuable to the armed forces. Given its history, the Thai military is very comfortable taking on political responsibilities. Where critics see coups as a failure of leadership and government, Thai military officers emphasise the role such interventions play as circuit breakers and acts of custodianship. The military only ever steps in when key national interests are threatened, such as during times of sustained internal strife, or when the monarchy is imperilled. Corrupt politicians, who are the standard targets for the military, struggle against the legitimacy claimed by those sworn to defend the king and his family. In the past, the Thai military has surrendered its power after resetting political arrangements. The promulgation of a new constitution was a critical step in this process. After the 2014 coup, it took two years for a new national charter to be endorsed. It is unclear when elections under the 2016 constitution will happen. But the charter provides plenty of opportunity for the military to retain control over significant aspects of Thai society. The major concern for Thailand’s military leaders is that the new king will take time to establish his credibility. There is the chance that the past decade’s political conflict could re-emerge. So-called ‘red shirt’ protestors, who were allied to deposed former Prime Minister Thaksin after the 2006 coup, have been relatively restrained in their opposition to military rule since the 2014 coup. It is unlikely that new flare-ups of popular protest will occur until after the period of mourning for King Bhumibol is complete. The military will worry that a confluence of unfavourable conditions could then ignite major nationwide mobilisations, especially in the provinces of the north and northeast where it is assumed Thaksin retains much of his previous support. The current quiet period does not, as such, mark the end of hostilities between pro- and anti-Thaksin forces. The military faces cultural and economic discontent that will continue regardless of what Thaksin or his forces do. Millions of people in provincial Thailand still resent the unfair distribution of opportunity and prosperity. As economic conditions in Bangkok and the surrounding provinces have improved, those parts of the country where agriculture still makes up a significant part of the local economy have fallen behind in relative terms. The perception of inequality has grown even though the quality of life in provincial and rural Thailand is higher than ever. This paradox drove the Thaksin political juggernaut from 2001 to 2006 and led to the election of Thaksin-aligned politicians in 2007 and 2011. As a sign I spotted at a Thaksin rally in Chiang Rai province before the coup in 2006 put it: “How ever many elections, we [always] vote for the Thai Rak Thai party”. For the military, such sustained support for their nemesis, against whom they have launched two coups, needs to be carefully handled. There is a risk that they will misjudge the popular mood. As a pre-emptive measure, the Prayuth government has been strict with critics and potential critics. It actively monitors the internet and works to stamp out dissent from potentially hostile political actors, especially those with ‘red shirt’ leanings. Keeping a close watch on international media coverage is another task made more difficult in the wake of King Bhumibol’s death when detailed and critical accounts of his successor began to emerge. As more attention focuses on King Vajiralongkorn’s biography and personality, there will undoubtedly be even more sustained efforts to monitor subversive content. There is little immediate risk of another revolution, but the military will still worry about the possibility of rebellious forces taking to the streets in large numbers. In this context, continuing to support the king, the palaces, the commercial elite, and the bureaucratic establishment justifies an enduring military presence at the heart of national politics. Even once power has been transferred to appropriately docile politicians, the military will maintain its role guarding against instability. It is very unlikely that 2014 saw Thailand’s last coup. Can the southern insurgency threaten Thailand’s jealously guarded territorial integrity? Another issue is whether the military has the wherewithal to handle the festering conflict in the southern provinces. For more than a decade, Thai authorities have struggled to explain, let alone control, a simmering civil war in the Malay Muslim majority areas along the border with Malaysia. During this period, most of the violence has been contained to a small number of provinces, notably Yala, Pattani and Narathiwat, and within those provinces concentrated in certain districts, such as Bunnag Sata in Yala province. In a break from that pattern, the Queen’s Birthday holiday in August 2016 saw a series of coordinated bombings and arson attacks across other provinces in southern Thailand, including Surat Thani, Phuket, and Prachuab Khiri Khan. The Thai government moved quickly to disavow a link with the conflict in southern Thailand, although that judgement now appears to have been premature. It is most likely that the attacks were the work of southern militants, eager to show that they possess the operational and technical capacity to launch attacks far from their traditional strongholds. The message was heard loud and clear among security officials in Bangkok. Southern Thailand’s insurgents have proved resilient in the face of counter-insurgency operations by the Thai army and various paramilitary organisations. There is no indication that the Barisan Revolusi Nasional (BRN), southern Thailand’s National Revolutionary Front, has ever struggled to regenerate its fighting capacity. Deep reservoirs of support among Malay Muslims, on both the Thai and Malaysian sides of the border, have helped to sustain the separatist cause. Thai security officials are exasperated by the difficulties they face in negotiating towards what they consider a reasonable settlement of the conflict. It is in the long term that the damage inflicted by the insurgency will become most apparent. Shifts in the wider regional order, especially in relations between the Buddhist and Muslim societies of the Association of Southeast Asian Nations (ASEAN), will encourage southern Thai separatists to continue waging their campaign. It appears they are prepared to wait for Bangkok’s security decision-makers to eventually give up the fight against them. They have also, on current evidence, made a strategic determination to avoid connections with global jihadist movements, preferring instead to present their struggle as a local one, where Islamic principles are only one pillar of the justification for violence. Malay Muslims are resentful of what they consider Thai colonial rule, and resent the lack of respect for their language, culture, and identity. The most dangerous scenario for the government in Bangkok is one where Thailand’s neighbours are no longer willing to support its claims to Yala, Pattani, and Narathiwat. For example, if relations between Malaysia and Thailand were ever to deteriorate significantly then the status of Thailand’s southern provinces could become a major sore point. Another risk is that any success enjoyed by southern separatists inspires the country’s northeastern provinces to make more assertive calls for autonomous status. It is easy to dismiss such hypotheticals simply because the territory claimed by Thailand has been stable since the Second World War. A longer historical perspective shows there is no guarantee that Thailand will always be able to manage such challenges to its territorial integrity. Instability in Thailand has implications for ASEAN, especially when the regional grouping is divided on the big issues, such as the South China Sea. Thailand was in the past an active contributor to discussions of Southeast Asia’s security, political, economic, and environmental challenges. Much of the positive agenda championed by ASEAN was a result of Thai activism. The Thai Ministry of Foreign Affairs was a well-regarded institution, staffed by capable officials. They took pride in Thailand’s democratic institutions and would offer some of the most consistently liberal interventions on regional issues. The past decade of domestic political strife has undermined Thailand’s regional standing. The diminution of its diplomatic capital is partly a result of the authoritarian turn in Thai politics. It can also be explained, however, by changes inside Thailand’s key diplomatic, security, and cultural institutions. Thailand now presents an austere and unflinching face to the world. The country’s humourless bureaucrats threaten journalists and academics, while the space for discussion in Thailand of ordinary political matters is greatly constrained. The country ends up satirised for the disjuncture between draconian restrictions on free speech and its free-wheeling entertainment industries. Even the most skilled diplomats have struggled to explain what is going on. Some neighbouring countries are quietly pleased that Thailand remains so domestically preoccupied. As Thailand has stumbled, others in the immediate region have prospered. Myanmar and Vietnam are the most notable examples. Their domestic political problems look modest by comparison. Myanmar’s re-emergence as a tourism and investment destination has been especially well timed. With Aung San Suu Kyi’s government in power it is now mainland Southeast Asia’s most likely prospect for democratic consolidation, even though it will be a bumpy ride. Myanmar’s abrupt change in fortune irks Bangkok. The generals in Naypyitaw were once convenient pariahs. But now the two countries have switched positions. Furthermore, what was once an intimate Thai–US security relationship has strained over the past decade under the weight of the two anti-Thaksin military coups. While the United States Government voiced concerns about Thaksin’s government, particularly regarding its well-documented human rights abuses, relations between the two countries also benefited from the consolidation of democracy in Thailand. Under President Donald Trump, the United States may give Thailand more space to determine its own political arrangements, which may end up gently reversing Thailand’s recent tilt towards China. More generally, there is little optimism about Thailand’s democratic future, with anticipation that the military will hold fast to its role as the custodian of national destiny. Long-term military rule will put some limits on the level of interaction that Thailand has with the European Union and Britain. For the moment, however, Japan, Korea, and Australia appear much less likely to cut ties as a result of Thailand’s drift back to military rule, and all three have maintained high-level interaction with Thailand since the 2014 coup. For all of these foreign powers, China’s role in Thailand is a major focus of attention. Under recent military governments, ties between Beijing and Bangkok have been strengthened. Given the depth of security relations between Thailand and the western democracies, any significant shifts in Thailand’s alliance relations could have much broader strategic ramifications. For now, Thailand, under General Prayuth, appears comfortable seeking to maintain open channels of communication and collaboration with as many partners as possible. Yet, in future, it may be forced to make difficult choices about how much it continues to invest in working with the Western powers. Thailand will postpone that decision for as long as possible, but that may not be forever. Notwithstanding doubts about his suitability, King Vajiralongkorn is being taken very seriously by many of his own people, including senior military decision-makers. His chequered reputation will not unduly influence the respect that many Thais feel for the position of king. On the Chakri throne, in his regal finery, surrounded by the architecture and pomp of a 235-year dynasty, and protected by the arcane royal form of the Thai language and a vast retinue of attendants, bodyguards, and advisers, King Maha Vajiralongkorn has deep spiritual and material resources at his personal disposal. Foreign governments will do well to gently engage with him early in his reign, lest he begins to assume that he is being deliberately snubbed. There are strong indications that the new king does not take criticism or perceived slights well, and may end up assuming that there is an orchestrated campaign against him. King Vajiralongkorn will likely spend significant amounts of time outside Thailand. In recent years, southern Germany has been a preferred sanctuary, although he may find that other places are equally tempting retreats from the scrutiny that his new position will bring. The new king’s predilection for regular changes of scenery ensures that senior figures in the palace, civilian, and military bureaucracies will continue to play important roles in the day-to-day management of the crucial royal–military nexus. King Vajiralongkorn will delegate extensively, and it is likely that, over time, new power centres emerge to serve, in a more or less independent fashion, whatever is agreed as the king’s policy preference. Thailand’s military government still feels wronged by the negative attention it has received since the 2014 coup, and will want to see its own status rehabilitated. The most obvious headache for the military will be any setbacks in its efforts to re-establish a stage-managed democracy, especially if popular protests against military rule expose it to international condemnation. Western governments should make their decisions about how they interact with General Prayuth’s leadership team based on whether it appears to be supporting a prompt return to democratic rule. In the meantime, there is no benefit to prematurely rewarding the senior military leadership, who would feel vindicated in their decision to depose Prime Minister Yingluck Shinawatra back in 2014. Rolling violence in southern Thailand means that Western governments need to plan for the escalation or further aggravation of that conflict. There is still the possibility of attacks by southern insurgents against high-profile targets, including foreign ones, elsewhere in Thailand. But the ongoing civil war is also gradually weakening Thai resolve. In this war of attrition, the Thai government may face demands for a political settlement that ends up further undermining confidence in Thai coherence and unity. The most likely future for Thailand is one in which the authoritarian instincts of the military and the monarchy reinforce their mutual survival pact. King Vajiralongkorn will rely on the loyalty of the senior officers and the troops they command. Meanwhile, the military will be eager to demonstrate its loyalty to the king and his family. Dissenters will continue to be harassed and arrested. Re-establishing democracy will be a low priority, although there will be efforts to assuage the concerns of the remaining critics from the Western liberal democracies. Longer term, the royal family could be challenged by questions of legitimacy, but while the military is prepared to support their status there is little chance of the dynasty coming to an end. Instead, there will be further rounds of speculation whenever the health of the incumbent monarch appears to falter. Future generations of military commanders will continue to manage a broad portfolio of security, political, economic, cultural, and strategic interests. Given the preponderance of authoritarian regimes across the Southeast Asian region, Thailand will remain in good company among the other ASEAN states. Nevertheless, at the core of Thailand’s triple threat is the possibility that the untested nexus between the new king and the powerbrokers in the military will prove insufficiently strong. Even if everything goes according to plan, today’s authoritarian establishment in Bangkok risks inspiring new challengers to its interests. And if everything goes bad at the same time, Thailand could become even more unstable and unpredictable. The best solution would be for Thailand to create an institutional structure that does not motivate so much opposition, whether from Malay Muslim insurgents or from the disenfranchised pro-Thaksin majority. Such a structure appears unlikely under current conditions. But the lessons from elsewhere in the world are that risks of these types can only be managed for so long before something goes more profoundly awry. A revitalised democratic system — with much greater decentralisation and an emphasis on creating meaningful economic opportunities for people in provincial areas — probably has the best chance of ensuring a stable and prosperous future for the country. On current evidence, it is doubtful that Thailand’s elite has the right incentives to build and then adequately defend such a political order. Pavin Chachavalpongpun, “Controversies Surrounding Thailand’s Next King”, Japan Times, 14 October 2016, http://www.japantimes.co.jp/opinion/2016/10/14/commentary/world-commentary/controversies-surrounding-thailands-next-king/#.WFswrHq3Teo. For a detailed historical discussion of the lèse-majesté law, see David Streckfuss, Truth on trial in Thailand: Defamation, treason, and lèse-majesté (Abingdon: Routledge, 2010). Professor Andrew Walker has made one of the more interesting and important arguments about the role of the new king: Andrew Walker, “Why King Vajiralongkorn Will Be Good for Thai Democracy”, New Mandala, 23 April 2010, http://www.newmandala.org/why-king-vajiralongkorn-will-be-good-for-thai-democracy/. For a thoughtful discussion of the 2016 constitution, see Allen Hicken, “Thailand’s Containment Constitution”, New Mandala, 28 April 2016, http://www.newmandala.org/thailands-containment-constitution/; Patrick Jory, “The Real Meaning of Thailand’s Referendum”, New Mandala, 22 August 2016, http://www.newmandala.org/real-meaning-thailands-referendum/. Paul Sanderson, “A New Breed of Terror in Thailand”, New Mandala, 18 August 2016, http://www.newmandala.org/new-breed-terror-thailand/; see also Zachary Abuza, “Two Suspects in Thailand’s Blasts”, New Mandala, 13 August 2016, http://www.newmandala.org/two-suspects-thailands-blasts/. Panarat Thepgumpanat and Patpicha Tanakasempipat, “Wave of Attacks across Southern Thailand after New Constitution Signed”, Reuters, 7 April 2017, http://www.reuters.com/article/us-thailand-south-attacks-idUSKBN17908H; Liam Cochrane, “Car Bomb Attack Outside Busy Pattani Supermarket in Thailand Injures at Least 60”, ABC News, 10 May 2017, http://www.abc.net.au/news/2017-05-10/car-bomb-attack-outside-thailand-supermarket-injures-60/8512732. Jon Sharman, “Bangkok Bomb: Explosion at Hospital in Thailand Leaves at Least 24 Injured”, The Independent, 22 May 2017, http://www.independent.co.uk/news/world/asia/bangkok-bomb-thailand-hospital-explosion-24-injured-latest-a7748491.html. “Mass Display of Grief on Late Thailand King’s Birthday”, The Indian Express, 5 December 2016, http://indianexpress.com/article/world/world-news/mass-display-of-grief-on-late-thailand-kings-birthday-4411031/. Andrew Griffin, “Facebook Blocks Video of Thailand’s King Wearing a Crop Top”, The Independent, 11 May 2017, http://www.independent.co.uk/life-style/gadgets-and-tech/news/facebook-thailand-king-thai-video-crop-top-bodindradebayavarangkun-maha-vajiralongkorn-a7729886.html. Oliver Holmes, “Thailand Bans Online Contact with Three Critics of Regime”, The Guardian, 13 April 2017, https://www.theguardian.com/world/2017/apr/13/thailand-bans-online-sharing-of-articles-by-three-critics-of-regime. Pavin Chachavalpongpun, “Kingdom of Fear (and Favour)”, New Mandala, 18 April 2017, http://www.newmandala.org/kingdom-fear-favour/. Thawatt Mokarapong, History of the Thai Revolution: A Study in Political Behaviour (Bangkok: Chalermnit, 1972). Daniel Fineman, A Special Relationship: The United States and Military Government in Thailand, 1947–1958 (Honolulu: University of Hawai’i Press, 1997). For details on this period, see Richard A Ruth, In Buddha’s Company: Thai Soldiers in the Vietnam War (Honolulu: University of Hawai’i Press, 2010). Surachai Sirikrai, “General Prem Survives on a Conservative Line”, Asian Survey 22, No 11 (1982), 1093–1104. “On Bhumibolists and Royalists”, New Mandala, 21 May 2010, http://www.newmandala.org/on-bhumibolists-and-royalists/. See Duncan McCargo and Ukrist Pathmanand, The Thaksinization of Thailand (Copenhagen: NIAS Press, 2005). For a useful account of Thailand’s recent, turbulent history, see Andrew MacGregor Marshall, A Kingdom in Crisis: Thailand’s Struggle for Democracy in the Twenty-First Century (London: Zed Books, 2014). It is another book banned in Thailand. Duncan McCargo, Tearing Apart the Land: Islam and Legitimacy in Southern Thailand (Ithaca: Cornell University Press, 2008); Marc Askew, “Thailand’s Intractable Southern War: Policy, Insurgency and Discourse”, Contemporary Southeast Asia: A Journal of International and Strategic Affairs 30, No 2 (2008), 186–214. Somchai Jitsuchon, “Thailand in a Middle-income Trap”, TDRI Quarterly Review 27, No 2 (2012), 13–20; see also Jonathan Rigg, Buapun Promphaking and Ann Le Mare, “Personalizing the Middle-income Trap: An Inter-generational Migrant View from Rural Thailand”, World Development 59 (2014), 184–198. Max Grömping, “‘Echo Chambers’: Partisan Facebook Groups during the 2014 Thai Election”, Asia Pacific Media Educator 24, No 1 (2014), 39–59; Benjamin Nyblade, Angela O’Mahony and Aim Sinpeng, “Social Media Data and the Dynamics of Thai Protests”, Asian Journal of Social Science 43, No 5 (2015), 545–566. Aim Sinpeng, “State Repression in Cyberspace: The Case of Thailand”, Asian Politics & Policy 5, No 3 (2013), 421–440. The most notable example is King Chulalongkorn (Rama V), who ruled from 1868 to 1910. A good account of the Chulalongkorn mythology can be found in Irene Stengs, Worshipping the Great Moderniser: King Chulalongkorn, Patron Saint of the Thai Middle Class (Singapore: NUS Press, 2009). In December 2016, King Vajiralongkorn appointed his privy councillors: eight from his father’s council, including General Prem as chairman, and five new members, three of whom are army generals who were members of the military junta after the May 2014 coup. In total the council includes five generals and one air marshal, alongside retired judges, ministers, and senior bureaucrats. Forbes continues to estimate that Thailand’s king is the world’s wealthiest, a claim often disputed by the Thai authorities. For a fuller introduction to this argument, see Craig Reynolds et al, “Time’s Arrow and the Burden of the Past: A Primer on the Thai Un-State”, Sensate, 2012, http://sensatejournal.com/2012/05/craig-reynolds-et-al-times-arrow/. For a discussion of these issues, see Nicholas Farrelly, “Why Democracy Struggles: Thailand’s Elite Coup Culture”, Australian Journal of International Affairs 67, No 3 (2013), 281–296. For a good primer on this cultural and economic context, see Andrew Walker, Thailand’s Political Peasants: Power in the Modern Rural Economy (Madison: University of Wisconsin Press, 2012). For a fuller description of that rally, see Nicholas Farrelly, “Yes, sir, I Understood”, New Mandala, 16 August 2006, http://www.newmandala.org/“yes-sir-i-understood”/. Desmond Ball and Nicholas Farrelly, “Interpreting 10 Years of Violence in Thailand’s Deep South”, Security Challenges 8, No 2 (2012), 1–18. For context, see Aurel Croissant, “Unrest in South Thailand: Contours, Causes, and Consequences since 2001”, Contemporary Southeast Asia 27, No 1 (2005), 21–43. Michael K Jerryson, Buddhist Fury: Religion and Violence in Southern Thailand (Oxford: Oxford University Press, 2011). For more on Thailand’s territorial politics, see Thongchai Winichakul, Siam Mapped: A History of the Geo-body of a Nation (Honolulu: University of Hawai’i Press, 1994). For early discussion of this point, see Nicholas Farrelly, “Burma and Thailand, Thailand and Burma”, Asian Currents, April 2010, 4–5. See Walter Russell Mead, “Thailand Gets Cozy with China”, The American Interest, 22 December 2016, http://www.the-american-interest.com/2016/12/21/thailand-gets-cozy-with-china/. Dr Nicholas Farrelly is an academic specialist on Southeast Asian politics who has spent much of his career examining Thailand. He is a Deputy Director in the Coral Bell School of Asia Pacific Affairs, College of Asia and the Pacific, at the Australian National University, as well as Director of the ANU Myanmar Research Centre. In 2006 Dr Farrelly founded New Mandala, which is a prominent forum for the discussion of Thai political topics.